We had scheduled an early morning (4:55 a.m. pickup!) 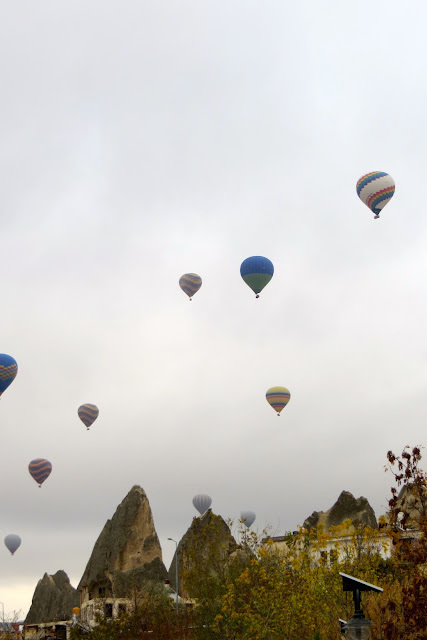 hot air balloon ride, watching the sun rise over Cappadocia. I guess it just wasn't meant to be, because I woke this morning with kind of a "funny tummy"--so I thought it was wise to say closer to town. It's a HUGE disappointment, as I was so looking forward to a balloon ride over this incredible landscape. A nice young couple staying at our hotel did go up this morning, and afterwards said they were somewhat disappointed in the experience, as there was not much wind so they didn't go far. It was also foggy this morning and the balloons didn't fly very high. So maybe it's a good thing, my "funny tummy" saved us $450.00! And that would have been a BIG splurge for these thrifty travelers--we're NOT the Rockefellers, you know! which worked wonders! By about 10 a.m. I was feeling much better. We really wanted to see more of the area around Goreme, but couldn't find a tour that was quite right for us. Mustafah called the tour company, and arranged for them to change their itinerary around--is there anything this man won't do for his guests? 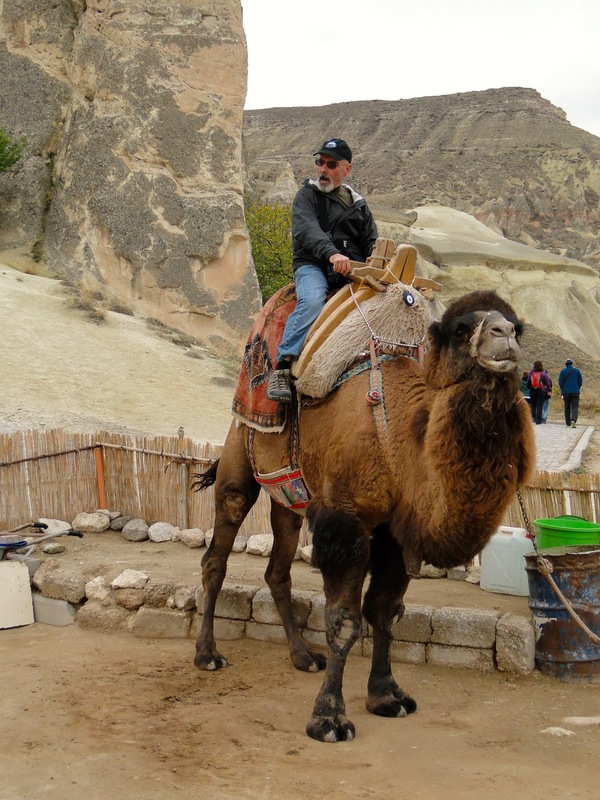 The order of the stops was reversed, ending at The Goreme Open Air Museum, which we had already been to on Sunday. They were happy to drop us off right before the rest of the group headed to the museum, and even reduced the price of the tour for us! We have just been blown away by the extraordinary kindness of the Turkish people--especially in Goreme. 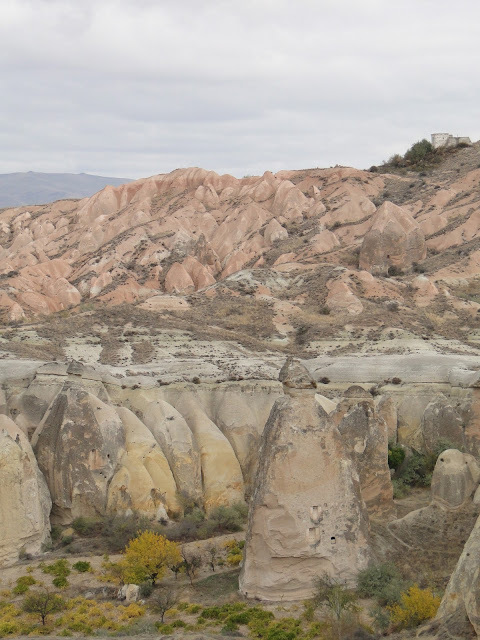 This tour was a shorter one than yesterday, covering some areas closer to Goreme. 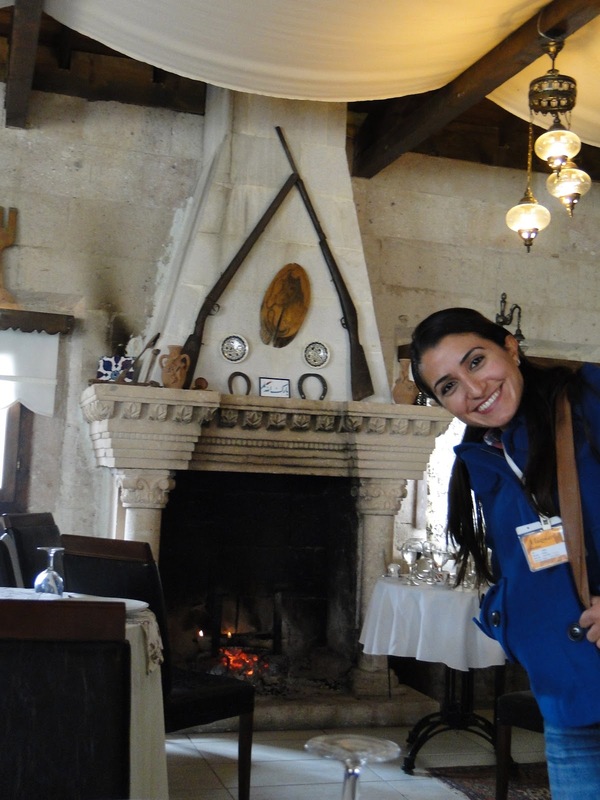 Our guide was a young lady named Tugba-pronounced just like the musical instrument. She was very enthusiastic and had a fun sense of humor. Our first stop was the very small village of Cavusin, where we climbed up a steep hill to an viewpoint overlooking the Rose Valley. 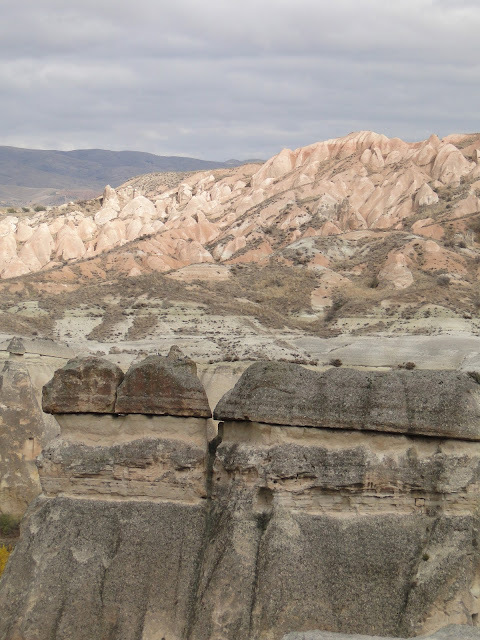 I was sure glad when Tugba told us this was the only climb of the day--my legs are still sore from yesterday's hike up to the Selime Monastery! The old village of Cavusin is carved into a large high cliff. 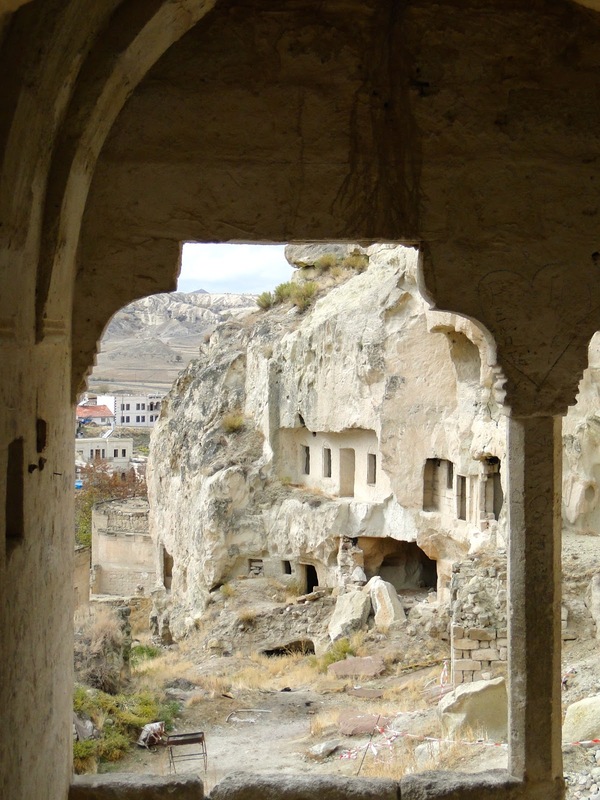 It was built around the Church of St. John the Baptist, which is believed to date back to the 5th Century. 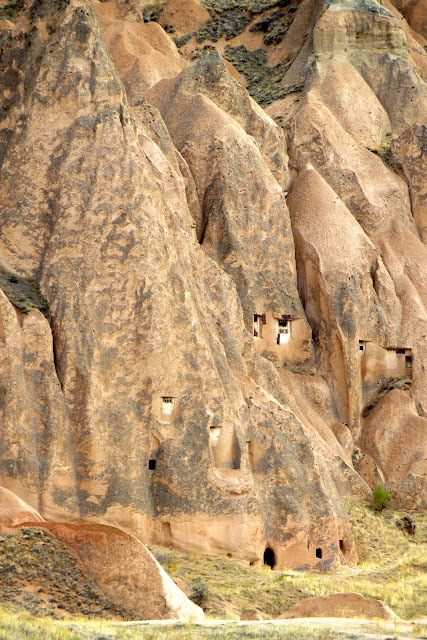 The old village was inhabited until the 1950's, when an earthquake damaged most of the original cave and stone houses. Although there are still a few residents living in the old village it was largely abandoned after the quake. Today there is a "New Cavusin"--a very small town just down the road from the original village. A small store catering to tourists. They have scarves here, Dad--and I haven't even bought ONE! We saw a few of these carved tuffa pieces, Tugba told us they are new, likely to be used in a remodeling project. I liked this wagon with the two baskets; I wonder what they used it for? Maybe grapes? In this photo you can see small vineyards (upper part of photo). 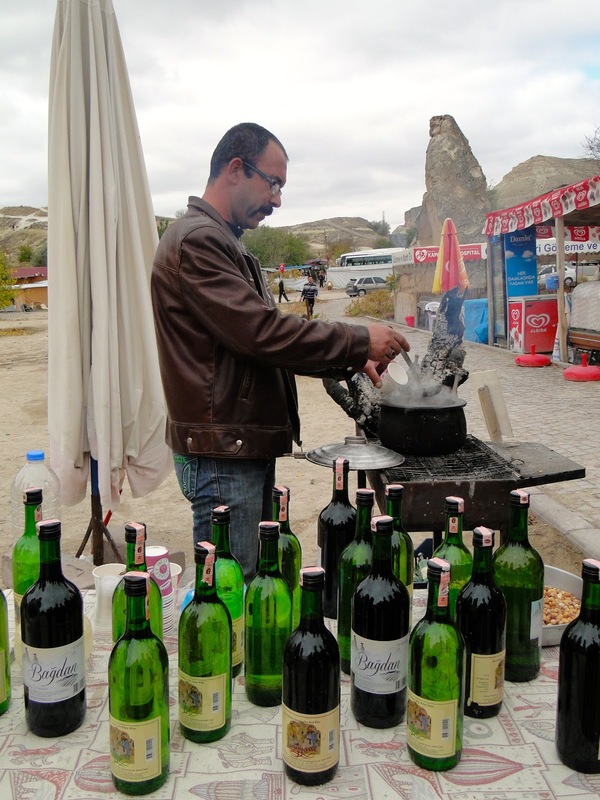 Grapes are a common crop in the Cappadocia region, and wine making is an important part of their economy. The vineyards look very different--they don't train their vines on posts and wires, but just let them grown naturally on the ground. We've also seen many apricot orchards with grapes planted between the trees; certainly a good use of resources! Our guide gave us a great, in depth explanation about the pigeon houses, how they were built and used. I had wondered how they got to the pigeon houses, because they are so high up. 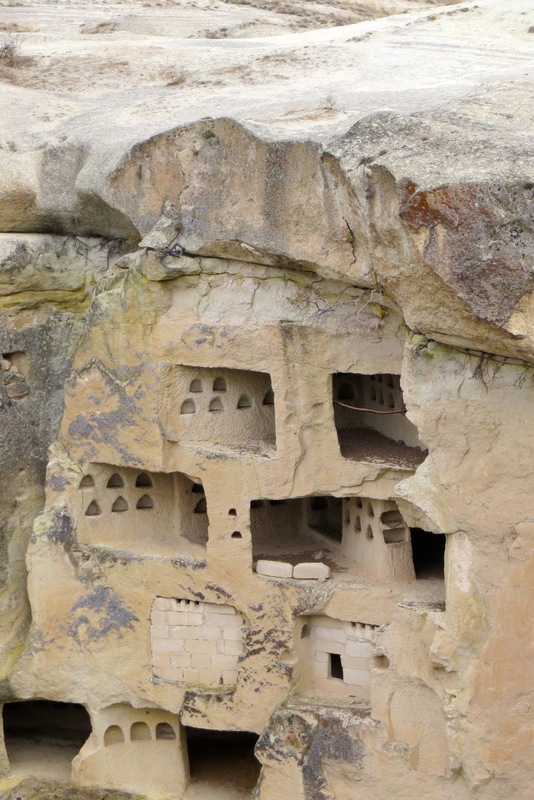 Tugba explained that they carved a door in the bottom of the cave (the door is in the bottom of this pic-slightly to the right); then they carved tunnels up to each level where they then carved the pigeon houses. Tugba said that people used to feed the pigeons as they were such an important part of their daily life. Although this isn't a widespread practice today, there are still a few families maintaining pigeon houses, and the eggs are used to mix with milk to feed to their children. After a short 10 minute drive we stopped at Imagination Valley We really did have to use our imaginations to see the shapes--their penguin was reallllly a stretch! This is "lady rock"
Our last stop before lunch was Pasabagi. As we got off the bus, we spotted this man selling hot spiced wine. David tried some--it was pretty good! Even a parking garage for a scooter! But the best part of Pasabagi was Clyde, the Camel! I was going to go for a ride, but that ladder was too rickety, Clyde was really tall, and I wasn't so sure I wouldn't just flop on Clyde and fall right off the other side! David was game, though! Off he goes, I think he's telling Clyde to giddy up! OK, maybe his name really isn't Clyde, but that's what we called him. Clyde, smiling for his close up! Another cooked in a stone casserole dish--this one was chicken and had tomatoes, peppers and potatoes. It was good, but not the best we've had. During lunch we were joined by a young couple from Pakistan--they were on their honeymoon and were so cute! He is a doctor, studying to take his cardiology boards. His new wife was shy, but very sweet. A couple from India joined us too, we'd been visiting with them at each stop, trading off taking each other's pictures. In our travels we've met the nicest people just by asking them to take our picture, and offering to take theirs. Even if the language barrier is huge--everyone seems to understand "photo?". What a fun lunch it was! It was so interesting to talk with both couples and hear about their countries. They had lots of questions about America, too! There was much good natured banter, with the young Pakistani doctor getting some husbandly advice--like just learn to say "yes, dear"! He encouraged us to visit Pakistan, saying we would love his country and people, and assuring us we would be very welcome. He so earnestly explained that his country was not just as portrayed in the media, the same as ours wasn't. I so enjoyed my conversation with this kind, warm young man. It really reinforced my belief that people really are the same all over the world-regardless of their nationality. How I wish there were no borders or wars! As we left after lunch, the young Pakistani doctor asked us to take a picture. We thought he was asking us to take their picture. He said no, that he wanted to have a picture of them with their new American friends. How sweet! Here we are, the young newlyweds and the "oldyweds"! After our wonderful lunch experience, we were off to our last stop. 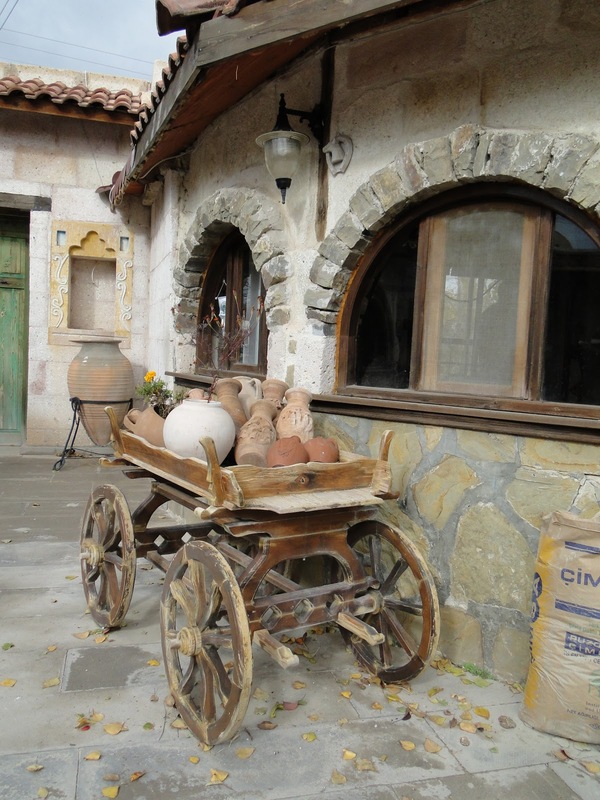 We drove in to the town of Avanos to a pottery manufacturing shop. One of the reasons we are hesitant to join tours is because of their "shopping stops" thinly disguised as cultural learning experiences! But actually this one was interesting and not high pressure at all. We watched a demonstration, and he offered to let us try. I sure didn't want to--I could only imagine how much of that clay I'd have all over me after just one turn of that wheel! They make two types of pottery here, using both red clay and white clay. These first two plates are white clay. I liked the white clay pottery best, the designs are very colorful, almost whimsical. I've been looking at some of the painted bowls in the shops in Goreme--trying to figure out how to get them home! 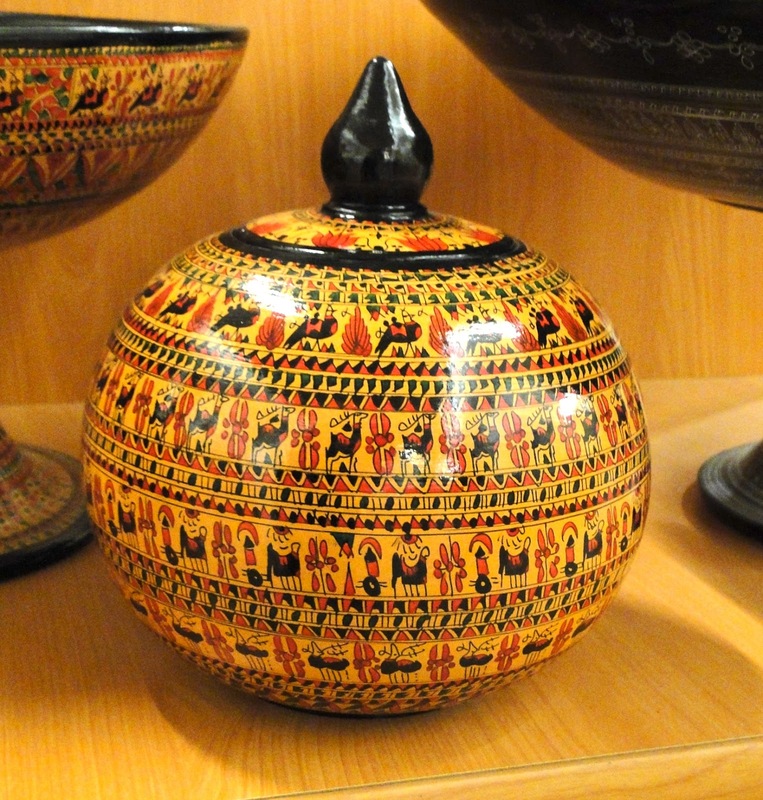 This is just one example of the red clay pottery. The colors were more subdued, and the designs very traditional. Mom--doesn't this little pot remind you of those Peruvian gourds? 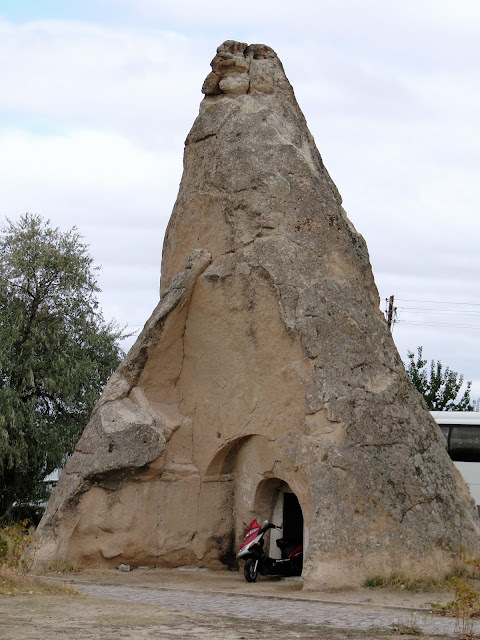 After the pottery stop, it was a short half hour drive back to Goreme, where we said goodbye to our "new friends" and were dropped off in the center of town. It was mid afternoon, and we decided to stroll around and shop a bit. I'd had my eye on an old child's tribal circumcision garment that I'd spotted on our first afternoon. I just couldn't forget about it--this was one of those "If I don't buy this, I'll regret it later" times! So I was ready to do some serious bargaining. I did my best, and got it for 20% less than their asking price. Certainly more expensive than my usual fridge magnet or scarf--but I LOVE it! It's going to hang on the wall in our family room, and I'll think of the wonderful village of Goreme every time I look at it. We picked up a few more trinkets--including the required fridge magnet and a Turkish cookbook in English. We walked up the steep hill to our hotel, dropped off our purchases, and settled our bill with the wonderful Mustafah. We thanked him sincerely for his kindness and generosity, what a lovely man he is. David said it was the best hotel stay he's ever had! 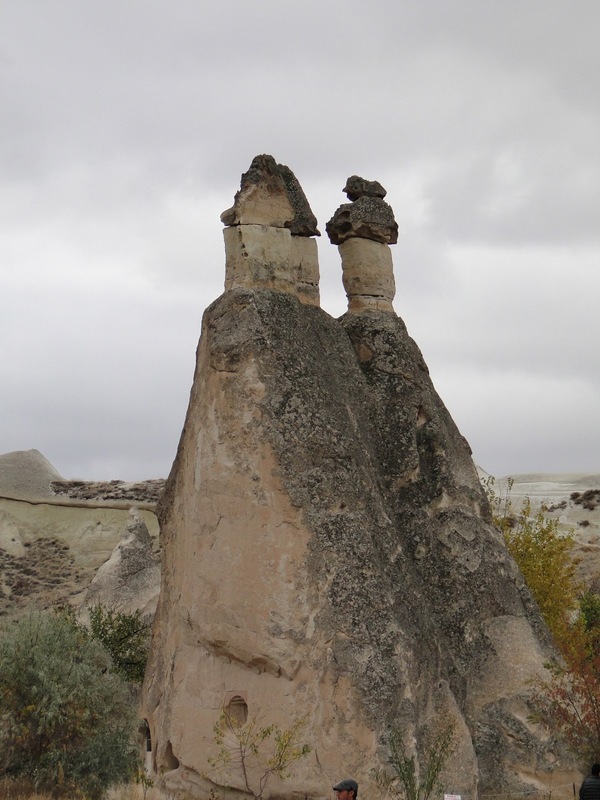 Our flight didn't leave Cappadocia until 10 pm, what was our travel agent thinking, anyway??? 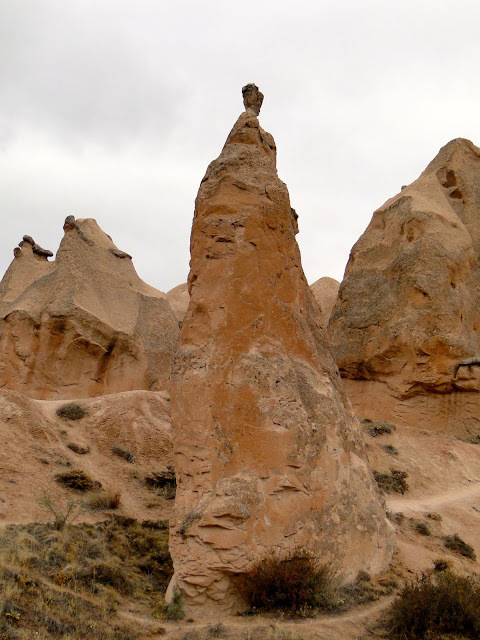 I guess I forgot that it gets dark early this time of year--but a couple more hours in Goreme is fine with us! 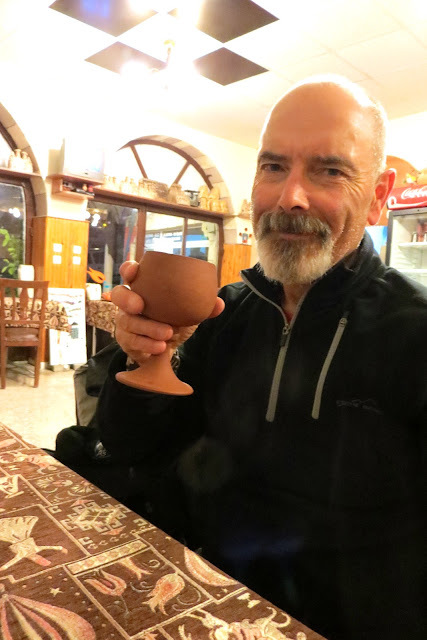 We found a small restaurant very near our hotel, and settled in for our last meal in Goreme. It was another family run business, with the mom and dad doing kitchen duty and their teenage daughter waiting tables. We lingered a while over dinner, talking about how much we'd enjoyed our three days in Goreme. We both rank it right up there as one of our favorite travel experiences ever! A short walk back up that steep hill (last time!) to The Arch Palace Hotel, a little last minute packing, and we were picked up promptly at 8 pm for our drive to the airport. 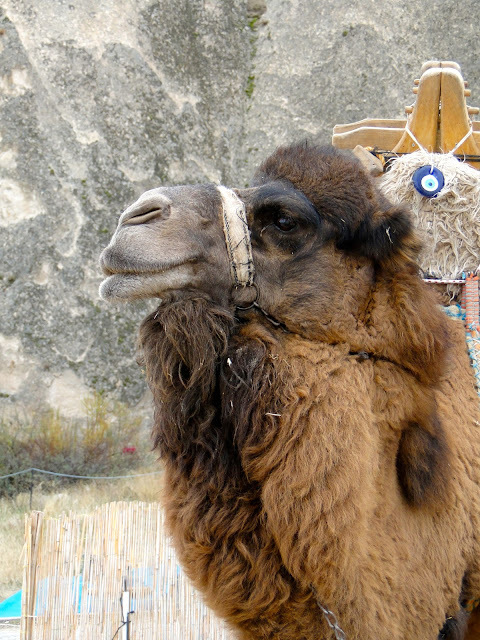 We were sad to say goodbye to wonderful, magical Goreme and it's lovely people. But we have lots more exploring to do in Istanbul! Our flight actually left 20 minutes early, and we soon landed in Istanbul. We caught a cab at the airport, and were back to our apartment at 12:30 am Wednesday morning. After that long and wonderful day, we just fell into bed! Tomorrow in Istanbul? We're not sure yet--but we're going to try to sleep in a bit. After morning call to prayer, that is! 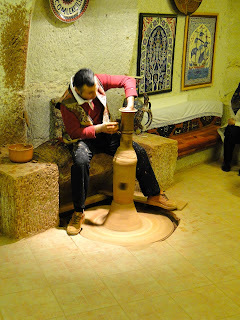 The pottery was exquisite. It reminds me of the Russian pottery that I collect, only more detailed. Wish you could bring some home... How blessed you are to be able to experience all of these wonderful sights and sounds and people. All is well here in Boise - but sure miss you. I got another 6 month reprieve today - good news health-wise. Sorry to hear that you were a little under the weather; but what a trooper you are. Look forward to your return next Fri. I'll be there waiting for you. Enjoy the next week of your journey. Hugs to you and Dave! !